Philosophy of Care: Listening carefully to patients’ problems and providing excellent diagnosis and care. Dr. Shah received his medical degree from Washington University in St. Louis. He completed his Internal Medicine training at the University of Michigan at Ann Arbor and was commended for excellence in care. Dr. Shah completed three years of Gastroenterology training at the University of Chicago where he participated in several research projects and wrote a chapter on Crohn’s disease. 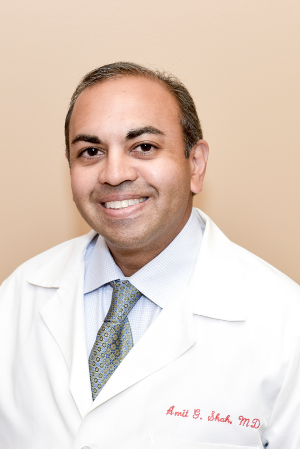 Dr. Shah has received extensive training in therapeutic endoscopy, inflammatory bowel diseases, hepatology, gastroenterology, and capsule endoscopy. Dr. Shah treats Barrett’s Esophagus with the HALO Radiofrequency ablation system to reduce or eliminate the risk of esophageal cancer. Dr. Shah has spent most of his life in the Chicago area. He was born in Aurora, Illinois and grew up in Matteson, Illinois. He currently lives in the Crystal Lake area with his wife and two children. In his personal life, Dr. Shah enjoys playing tennis and is a golfing enthusiast. He and his wife have traveled extensively worldwide – including trips to India, Europe and Asia. He enjoys fine arts and music. Dr. Shah believes listening carefully and compassionately to the problems of patients is very important. He continually strives for excellence in diagnosis, care and continued education and training in the newest gastrointestinal treatment and procedures.